"Takings, Efficiency, and Distributive Justice: A Response to Professor Dagan" by Glynn S. Lunney, Jr. In A Critical Reexamination of the Takings Jurisprudence, I addressed an efficiency problem that arises when the government attempts to change property rights in a manner that burdens a very few for the benefit of the very many. Specifically, in the absence of compensation, the collective action advantage of the few in organizing to oppose the proposed measure will often give them a decided edge against the many. As a result of that advantage, the few will too often be able to persuade the legislature not to act, even when an objective evaluation of the proposal's costs and benefits would demonstrate the action's desirability. From this perspective, the risk of an overly narrow compensation requirement is not that the government will take too much, but too little. The government will forgo desirable projects because of political opposition from the uncompensated few. 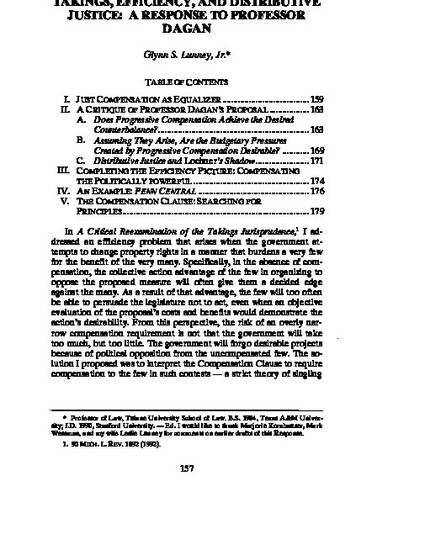 The solution I proposed was to interpret the Compensation Clause to require compensation to the few in such contests - a strict theory of singling out if you will. By doing so, we could reduce or, with full compensation, eliminate the few's opposition to the measure and thereby improve the legislature's ability both to evaluate the proposed action's merits and to go forward should action prove desirable. In a recent article, Professor Dagan recognizes the efficiency implications of this public choice analysis, critiques some aspects of my proposed solution, and offers an alternative based on a principle he calls "progressive compensation." In his analysis, he attempts to inject an express distributive justice component into the compensation analysis, while at the same time solving the efficiency problem that public choice theory suggests. Although Professor Dagan's analysis reminds us of the important role the Compensation Clause plays in equalizing results between politically powerful and politically weak property owners, I believe that his critique is unpersuasive and that his proposed solution, while ambitious, will not work in the manner he suggests.